It is that time of the year again indeed 'tis the season. Please feel free to interpret how you wish, if you go very weird on me perhaps a line of explanation is worth while, maybe even if you haven't gone weird. I'm hoping for entries from the northern and southern hemispheres which should give some interesting contrasts. I hope this is a good, wide title and brief but interesting. I always find with everything going on in December I never get the time I think I will to play with my camera. Please capture the season and enter the competition wherever in the world you may be. 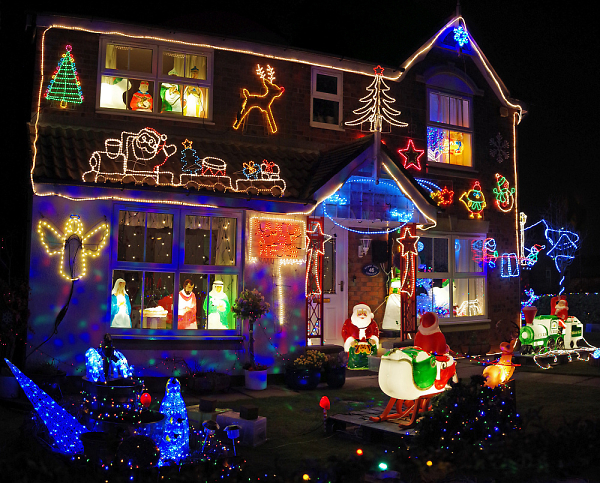 'Tis the season for competing for the biggest Christmas lights display. Out of date image removed - please remember all images should be shot in December 2018. Many thanks! Thank you for your entries. My thoughts on this months entries. A lovely splash of colour against a nicely defused neutral background. Sadly the Robin not sharp enough to be in with a chance on this occasion. A well judged exposure, well framed shot with a good plume of steam from your Santa Special. An award for the longest title. I love all the OTT house illuminations at this time of the year and this frame filling shot captures a fine example very well. What Christmas is to many of us, an opportunity for a family gathering. Shooting into the light like this comes with its challenges and I think the exposure is well judged. I've enjoyed having a look around the Riley dining room. A striking image! It's over cooked for my personal taste, I'd prefer it with a little less HDR. It is a well framed image and I'm certainly glad you didn't crop the bottom, I think the crowd are important to the image. A well judged exposure, always difficult to judge it right when you have very bright against very dark. I would like the left hand dear to have a bit more space and maybe a lower or different angle would have added a little dynamism. A tight crop of the troop in full song, it captures the occasion very well. The tight crop keeping us focused on the singers. Thanks to NigelK for the competition and giving me cause to look out for something suitable for it. Also thanks for the top spot on the podium (seems I've achieved the double this week/month!) Well done too to JR and dromfit, the other podium places, and to the others who didn't quite make it this time. Shame a few more didn't take the challenge to take their camera out as the theme allowed for a good range of interpretations. What I didn't state with my image was it was two vertical shots combined in Photoshop. The DA16-85 seems to allow for that very well. What's the issue with it? Thank you for the third slot from an interesting and challenging subject... making us try something different. Congrats to everyone else... inspiration as usual. Happy New Year and may all your pixels pop in 2019!! Still juggling with lens compatibility issues - used a Sigma DG zoom on the Robin but not getting the sharpness I would like and my K-50 has some mysterious ailment that says Expensive to me currently, So gambling on a possible k-70 or KP - did they mean that to sound like Peanuts! ?